Stored product insects and other pests represent a major hygiene and safety issue to many industries, from food production to building infestation, and issues for timber pallets and packaging. Beds bugs are rapidly becoming a public health issue in hotels, hostels and houses in many parts of the world. While fumigation has been one of the prevalent routes for pest control, there remain issues with the toxicity of the chemicals used and potential exposure to humans therefore heat treatment has proven to be a successful alternative when used correctly. It is well known that excessive heat is dangerous to life. There is a difference between the amount of heat required to kill microbes such as bacteria and viruses and that required to kill larger life forms such as insects or mammals. This book focuses on the use of heat to kill insects and mites in food production, storage and other facilities. 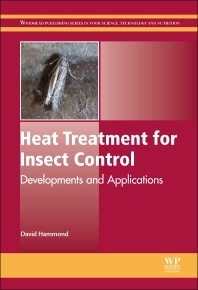 Heat Treatment for Insect Control examines how controlled heat treatment kills all stages of pest insect life across species and without causing damage to surrounding structures or electronics. The advantages of heat treatment include no health & safety hazards, a completely controllable and environmentally friendly process, reduced treatment time of fumigation (hours verses days), as well as no factory shutdown or exclusion of staff from adjacent areas during treatment. Part I reviews the principles of heat treatment, with chapters covering the fundamentals, planning, best practice and costs of integrated pest management. Part II looks at heat treatment applications in food production, storage, food materials and fresh produce. Part III examines the other applications in clothing, small rooms, buildings, and transportation. Dave Hammond BSc (Hons) is Managing Director of Thermokil, UK. With over 30 years’ experience in the pest control industry, he has also worked as a pest control consultant around the world including in New Zealand, Australia, Israel and Romania.